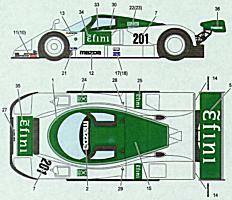 When Tamiya did a rerelease of their 787B kit in 1999, Studio 27 released no less than 4 different sets of decals, covering almost all 787 and 787B liveries. Scale Motorsport has released a set of composite pattern print decals and a very well detailed set of etched stainless steel parts, both designed to further enhance the looks of the Tamiya 787B kit. 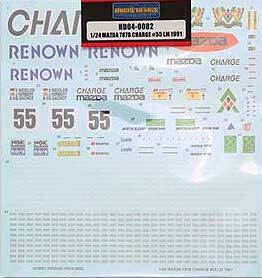 In June 2002, Museum Collection released a set of Hi Tech decals designed as a replacement for the decals in the Tamiya 787B kit. 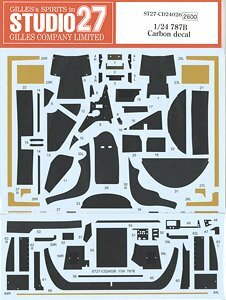 In addition to this both Studio 27 and Modeler released an etched stainless steel detail/upgrade set, the Studio 27 set contains some parts to help converting the Tamiya 787B into a 787 model. Note however that there are many differences between the 1990 787 and the 1991 787B, the most noticable ones being a 25mm increase in wheel base and a reshaped rear deck. I have to dig a bit deeper for exact details, but I think a spare Hasegawa 767B will prove very useful for converting the Tamiya kit to a proper 1990 787. Especially during the 1991 season the 787 and 787B cars competed in both WSC (World Sportscar Championship) and JSPC (Japan Sports Prototype Championship) so colors were changed often and the two types are difficult to tell apart. for 1991 WSC sprint races, 787 chassis nr.002 had small winglets fitted to the front corners of the nose. These winglets ran across the lower outer corners of the headlight covers. 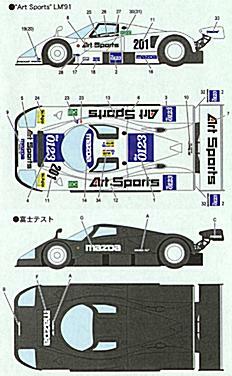 Note that during the 1990 season and early in the 1991 season up to the Le Mans 24hrs race, the 787's were fitted with 17in wheels similar to those in the Hasegawa 767B kits. 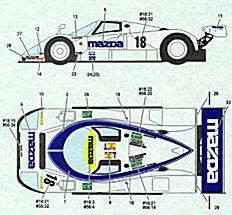 Starting with the Le Mans 1991 race both the 787 and 787B's were fitted with 18in wheels. At 1600 Yen each for the original 1999 releases, these decals are pretty expensive (same price as the entire Tamiya 787B kit) but printing quality is excellent. In addition to the decal sets covering the various 787B liveries, Studio 27 released a large set with carbon and kevlar pattern decals for the Tamiya 787B kits in November 2017. For more info on the Decals and Upgrade Sets, check the japanese online shops on my links page. Set 209 covers 787 chassis nr.001 in its 1990 Le Mans 'Art Sports' livery. This car failed to finish the 1990 Le Mans race due to an oil leak. In addition decals are provided for an unpainted test car as it was driven at the Fuji race track in preparation for Le Mans. All decals are provided to do both versions (although you have to add about an acre of carbon fibre print for the test car, Scale Motorsport sheets 1024 and 1020 are perfect for this). You can find a picture of an unpainted 787B on my car reference picture page. Set 210 covers the 'white' 787 and 787B that competed at Le Mans in 1991. Note that nr.18 is 787B chassis nr.001, whilst nr.56 is 787 chassis nr.002 fitted with 18in wheels. Nr.18 finished 6th and nr.56 finished 8th overall at the 1991 Le Mans race. 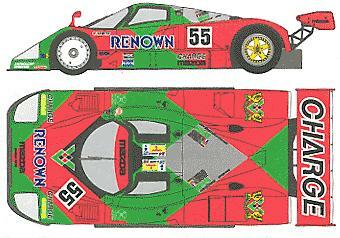 These decals can also be used for depicting the nr.18 car as it competed in most of the 1991 Group.C cat.2 World Sportscar Championship, do note however that this was 787 chassis nr.002, not 787B nr.001 ! The blue lines around the cabin are also provided as decals, the only decals missing are small 'T' symbols that would allow for making the spare car nr.18T (787 chassis nr.001) entered at the 1991 Le Mans race. Decals are provided for one complete car. The 2004 rerelease of this set has newly printed instructions and the decals are now printed by Cartograf. Although the layout of the rereleased sheet was changed, the designs are identical. Set 216 covers 787B chassis nr.001 that competed in the 1991 season of the All-Japan Sports Prototype Championship (JSPC) after it ran the 1991 Le Mans race. The green parts of the color scheme are all included on the decal sheet, apart from the rear wing, which has to be painted green. Note the typo in Johnny Herberts name (J.HERBART), you have to replace this decal with the one from the Tamiya kit. Decals are provided for one complete car, with a choice of racing numbers (18 or 201). The 2004 rerelease of this set has newly printed instructions and the decals are now printed by Cartograf. The layout of the rereleased sheet was changed and the names for the drivers are now printed in a slightly smaller size, but Johnny Herberts name is still spelt wrongly as J.HERBART . Set 228 covers 787 chassis nr.002 in its 1990 Le Mans 'Charge' livery and 787B chassis nr.003 in its 1991 JSPC 'Renown' livery. 787 nr.002 failed to finish the 1990 Le Mans race due to electrical problems. No color patches or white dashes are provided on this sheet. For the 'Charge' scheme the green patches can be taken from the Tamiya decal sheet, for either scheme the white dashes can also be taken from the Tamiya sheet. Decals are provided for one complete car, although only a couple of items keep you from completing the scheme for the other car as well, borrowing those items from the Tamiya sheet allows you to do both schemes. The 2004 rerelease of this set has newly printed instructions which include a full color photograph of 787B nr. 003 in its 1991 JSPC livery. The decals are now printed by Cartograf, the layout of the rereleased sheet was changed, a pair of decals with the name of Y.TERADA were added and the names for the drivers are now printed in a slightly smaller size. Johnny Herberts name is still spelt wrongly as J.HERBART but his name is not on the cars in the instructions. 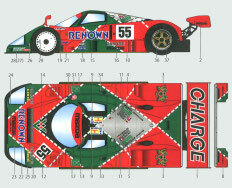 Set 959 offers decals for 787B chassis nr.002 in its 1991 Le Mans 'Charge' livery, similar to the decal set in the original Tamiya kit although the silver and green patches are not included. This time the names of all drivers are spelt correctly and a set of white dashed lines is included. 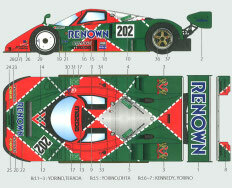 Set 960 offers decals for 787B chassis nr.003 in its 1991 JSPC 'Renown' livery, similar to set 228. This time a set of white dashed lines is included. Three sets of driver names are included to cover 7 different race events. Note that for some of these race events a high-downforce rear wing was fitted with larger end plates, for some races (JSPC 1991 rounds 6 and 7 a.o.) rear wheel bay covers were fitted as well. Neither the large wing end plates nor the wheel bay covers are included in the Tamiya kit but both items can be found in the Studio 27 upgrade sets. 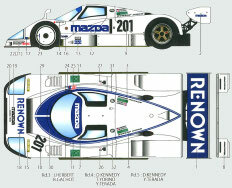 Set 961 offers decals for 787B chassis nr.001 in its 1991 JSPC white/blue 'Renown' livery. Driver names are included to cover three different race events and this time Johnny Herberts name is spelt correctly. Note that for some of these race events a high-downforce rear wing was fitted with larger end plates, these end plates are not included in the Tamiya kit but can be found in the Studio 27 upgrade sets. 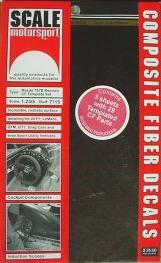 Set CD24026 offers carbon and kevlar pattern decals shaped to fit the parts of the Tamiya 787B kits. The set contains decals to cover almost all cockpit, chassis and engine bay parts, the patterns printed on the decals match the patterns on the actual car very well. 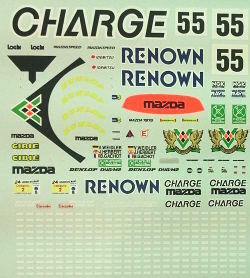 A large placement guide indicates clearly to which part each decal should be applied. 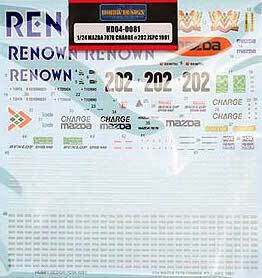 This is a set of Hi Tech decals, designed to replace the kit decals of the Tamiya 787B kit. The decals are identical to the ones in the kit (although the silver engine hatch patches are not included), but printing quality and color accuracy are much better. Even a set of white dashed lines is provided. High Tech decals have a special carrier film that you can tear off the model after the decal has settled, leaving just the printed image on the model. This is a bit tricky, the decal image can be damaged in the process so each sheet offers a complete set of spare decals plus some extras on top of that, so with a bit of luck you can do two cars from one sheet. A small set of High Tech decals for the nr.55 787B with additional photoetched steel parts and red ribbon for making seatbelts. All decals are included only once (no spares), a set of white dashed lines is included. This set consists of three different decal sheets, each with realistic carbon/kevlar patterns. The clever part is on the back of each sheet where reversed outlines are printed for each of the kit parts to be covered. Decals are provided for all exposed unpainted parts of a 787B. 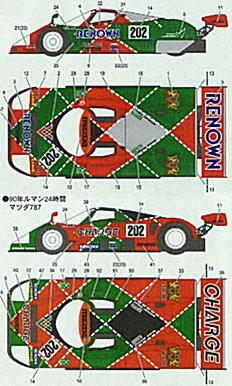 A set of high quality decals for 787B nr.202 in the 'reverse' Charge/Renown scheme as it competed in the 1991 Japanese Sportscar and Prototype Championship. This set contains all markings for the Charge scheme, including the white dashed lines. A set of high quality decals for 787B nr.55. This set contains all markings for the Charge scheme, including the white dashed lines. A set of high quality decals for 787B nr.55. This set contains all markings for the Charge scheme, including the white dashed lines and the black patch at the base of the windshield.